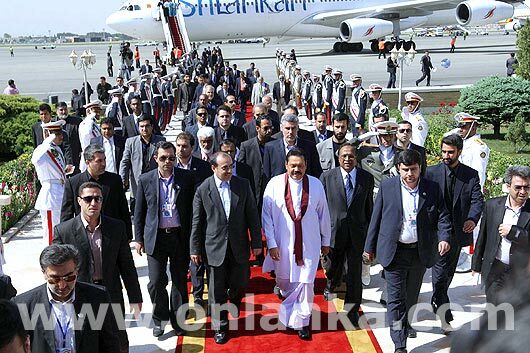 President Mahinda Rajapaksa arrived in Teheran on Sunday 16th May to attend the G15 Summit which is scheduled to begin at the International Islamic Conference Hall in the Iranian Capital on Monday. 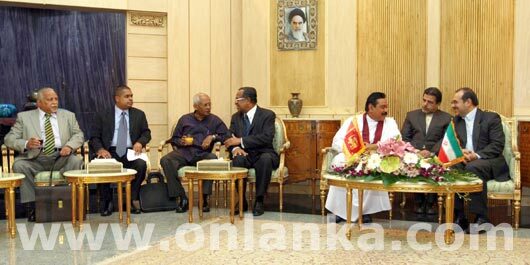 Sri Lankan President was received by Minister of Commerce of the Iranian Government Mr.Mahadi Ghazanfam at the Meherabad International Airport this morning. 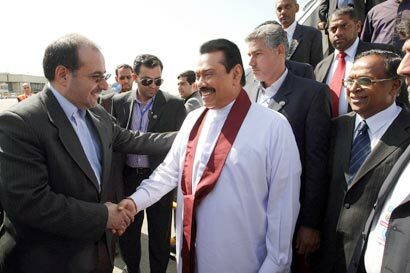 President Rajapaksa is due to be officially welcomed by President Mohamoud Ahmadinejad at the President’s Palace in Teheran this afternoon. He will take over the Chairmanship of G15 from his Iranian counterpart Ahmadinejad at the summit for a two year term. The membership of the Group of 15 (G15) has expanded to 18 countries, but the name has remained unchanged. The group comprises Algeria, Argentina, Brazil, Chile, Egypt, India, Indonesia, Iran, Jamaica, Kenya, Nigeria, Malaysia, Mexico, Peru, Senegal, Venezuela, Zimbabwe and Sri Lanka. It was established 20 years ago from developing countries in Asia, Africa and Latin America to enhance the economic, political and multilateral trade activities among the members and also to provide input for other international groups. The Summit will focus on cooperation among developing countries in the area of investment, trade and technology. The Group of 15 accounts for one third of the global population and consists of some of the biggest and powerful economies of the world. Sri Lankan delegation to the G15 Summit includes Minister of External Affairs Prof G.L.Peiris, Secretary to the President Lalith Weeratunga, Secretary of the Ministry of External Affairs Romesh Jayasinghe, Sajin Vas Gunawardena MP and the newly appointed Chairman of the Ceylon Petroleum Cooperation (CPC) Harry Jayawardena.